Why trust orthodontists…If you are having a problem with your bones or muscles you trust an orthopedist. For a skin, hair, or nail condition you trust a dermatologist. A cardiologist specializes in heart issues or you consult with a neurologist for frequent headaches or back issues related to the nervous system. When straightening teeth and correcting jaw problems, your smile is treated best in the hands of orthodontists. Orthodontists are also known as Orthodontic Specialists. “Specialist” has a double meaning in the health profession. It refers to the individual practitioner’s education and verifies they have limited their practice to one specialty, unlike a general dentist or general physician which can treat all areas of dentistry or medicine. Orthodontists first obtain a dental degree and then go on for an additional two to three years of education in orthodontic care at an accredited orthodontic residency program. Once completed, orthodontists focus their practices exclusively on the alignment of teeth and jaws rather than general dentists who manage multiple oral health care needs of all age groups or pediatric dentists who focus on the general dental needs of children and teens. According to the American Association of Orthodontists (AAO), from 2010 – 2012, 80% of orthodontic patients were children. However, of the 20 % that were over 18, there was a 14% increase in adult orthodontic treatment, which is a record high. Treatment times don’t take as long as in the past and adults are embracing more and more the value of a great smile, no matter what their age. It is not uncommon to find people in their 50s, 60s, and beyond wearing braces or aesthetic alternatives to treatment such as Invisalign. 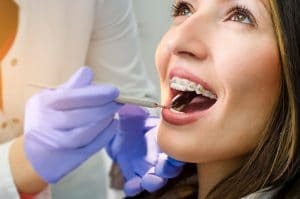 Before undergoing orthodontic treatment, make sure you choose an orthodontic specialist who has the experience and training you and family deserve when creating your new smile for best long-term results. At Moss Wall Orthodontics, we treat orthodontic patients all day long. We strive to maintain an environment that is focused on quality, mutual respect, superior results, and we do it in a fun way to make your experience with orthodontics a pleasant one. Contact our Lacey WA office today to schedule a FREE SMILE EXAM with an orthodontic specialist. We look forward to helping you create the smile you or a member of your family deserves… no matter what your age!